South Africa is often referred to as “the world in one country“, and for good reason- it has something to offer to everyone. 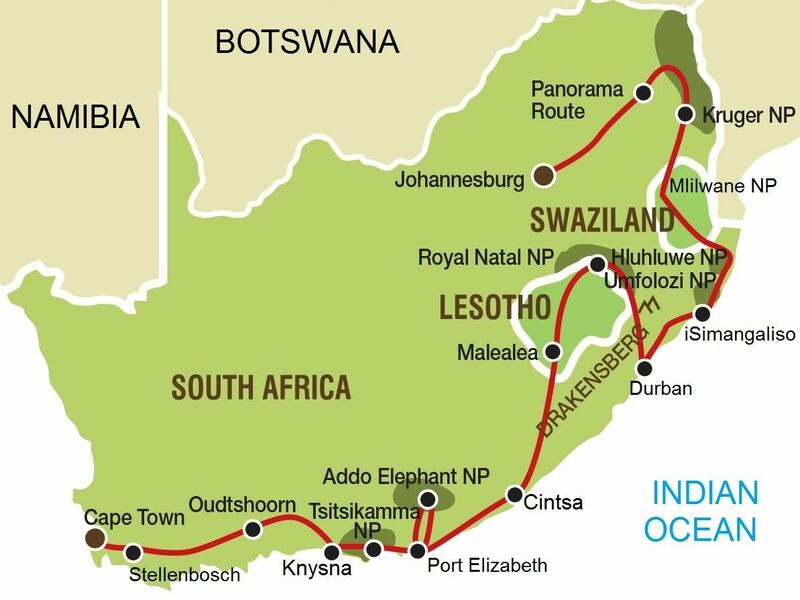 On this 20 day South Africa Tour we will explore some of the best known highlights. This tour will include lots of wild animals while on Safari, spectacular natural landscapes and a variety of cultures and peoples. We have a full day ahead of us which takes us from the bustling city centre of Cape Town via the vineyards to the town of Hermanus. En-route we will stop at the largest breeding colony of the African Penguin at Stony Point Nature Reserve. Made up of a collection of villages, farms, rivers, bays, coves and valleys, the Cape Whale Coast is a pristine stretch of the South African coastline which runs from the town of Rooiels for roughly 150km, to the east.During the months of July to November you may be lucky enough to see the southern right whales that visit the bay in Hermanus. We highly recommend that you arrive in Cape Town at least 1 day before the tour starts. This gives you some time to acclimatize... and there are loads to see and do in Cape Town. Crossing the Hottentots-Holland Mountains this morning we set out for the Klein Karoo and our overnight stop in Oudtshoorn. We follow the scenic Route 62 today, stopping to experience one of the many farm stalls on the way. One of the more quirky highlights today is Ronnie’s Shop... a rather interesting country pub! Our morning starts with a guided tour of the famous Cango Caves, we can only marvel at the astonishing formations that have formed in these impressive limestone caves. Returning above ground we make our way over the Outeniqua Mountains and descend to the beautiful Garden route coastline below. In the coming days we spend time hiking, relaxing at the beach and sampling the many optional activities available. The Garden Route is a treasure trove of beautiful beaches, forest walks and an exciting menu of optional adventures. While our morning is set aside for some relaxation on the beaches of Plettenberg Bay, today offers a number of optional activities and your guide will assist you to get the most out the day. This afternoon we have the opportunity to visit the hidden gem of Nature’s Valley, this beautiful village offers us a chance to enjoy a hike or simply relax on the pristine beach in this little paradise. In order to make the most of this day, the truck will run a set schedule and you are free to join or leave at the places that interest you. Tsitsikamma National Park is one of South Africa’s premier marine reserves and this morning we set out to explore the rugged coastline on foot. Our hike along the Waterfall Trail sees us cover the first section of the world renowned Otter Trail, this is not an easy hike and those who prefer a more leisurely option can make use of the boardwalks to the Storms River Mouth. We return after our hike and will have the chance to enjoy the Woodcutters Journey in the afternoon - experiencing the uniqueness of the Tsitsikamma biome and learning about the history of the area and it’s indigenous fauna & flora. This morning we set out for the Eastern Cape and the Addo National Park. We make a stop this morning in the surfing mecca of Jeffrey’s Bay, famous for its waves. You have the opportunity to visit the small surfing museum, catch a quick wave or simply enjoy a cup of coffee overlooking these famous waves. This afternoon we will make our first visit to seek the elephants after which Addo is named. This morning you will have the option to visit Port Elizabeth before returning to camp for lunch. In the afternoon we visit Addo, famed for the elephants after which the park was named. Recent expansion has seen Addo grow to become the third largest of South Africa’s National Parks. The unique vegetation of Addo supports a wide variety of wildlife and we will spend the afternoon in search of the animals that call Addo home. The historic town of Graaff-Reinet nestles in the heartland of the Great Karoo and offers a unique insight into the history of this arid region. It is also the fourth oldest town in the country. This evening you will have the opportunity to join a sundowner excursion to the Valley of Desolation, this unique valley offers a panoramic view over the town and the wide open plains stretching out below. Kindly note that during the winter months, this activity will become a Sunrise excursion to the valley of Desolation the following morning. We exit Lesotho and travel through the sandstone cliffs of Golden Gate. Our destination is the mountains of the Drakensberg. Running the length of the Kwazulu-Natal province, the Ukuhlamba Drakensberg Park is a UNESCO recognised world heritage site. Whether you go by the Zulu name uKhahlamba, meaning 'barrier of spears', or the Afrikaans name Drakensberge, meaning 'dragon mountains', these towering mountains are a hiker’s paradise and worthy of exploration. We set out this morning for a lengthy hike. Along our way we will have the opportunity to view examples of San rock art with a local guide. While we encourage everyone to make the most of the day in mountains, we may offer separate options depending on the activity level of the group. With a number of trails available we can ensure that we cater to every need, the most important aim is to ensure everyone enjoys this mountain paradise at their own pace. It’s all downhill as we leave the mountain scenery en route to the Kwazulu Natal Coast. On the 5th August 1962, police waved down a car on a lonely country road in KwaZulu-Natal. At the wheel was Nelson Mandela. He was arrested and spent 27 years in prison. Today you will have the opportunity to visit this historic capture site, marked by an impressive sculpture in honour of “Madiba”. We will also stop at the Howick Falls to listen to the power of the falls and take some photos at the view point. Then it’s onto the bustling city of Durban is South Africa’s largest port where you will have time to stretch your legs with a stroll along the promenade before heading for our final destination, St Lucia. This evening we enjoy a Zulu cultural experience, sampling the local beer and will be taught the basic Zulu language. We set out early this morning for a game drive (safari) in the nearby Hluhulwe-Imfolozi Game Reserve, one of the last strongholds of the endangered rhinoceros. While rhinoceros are the most famous of the parks inhabitants, the park also provides a home to many other species, including the Big-5 that we all hope to see. Returning to our lodging for a siesta, we freshen up for an afternoon boat cruise on St Lucia estuary. Endless hours of self-guided exploration within the small 4560ha Mlilwane sanctuary are possible due to the relative absence of dangerous game. This morning our guide will lead us out on a nature walk to explore the “ Nature Trail “ which provides interpretation of historical and environmental information of the area. Later this morning, we embark on a 2-hour guided walk through the Esijeni community, allowing us a glimpse of life on a day-to-day basis. This interactive experience could involve grinding maize, carrying water, building a wall or washing clothes in the steam. Setting off back to South Africa, we make aim for the Kruger National Park and begin with our first game drive (safari) in the overland truck as we enter the gates of the park. The Kruger National Park is South Africa’s flagship national park and sightings of the “ big five “ has become something of a quest for many guests. The Kruger NP has more that it’s fair share of animals and with approximately 147 mammal species we will spend our time in search of both big and small. Rising early this morning we enter the Kruger National Park to enjoy a full-day of game (wild animals) viewing. 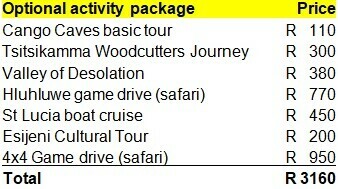 Our activity package offers the added excitement of experiencing the park from an open-sided 4x4 vehicle. For those who have not chosen the 4x4 game drive through the park, your guide will take you on a game drive (safari) in the overland truck (full day). This evening there is an opportunity for an optional Sundowner Drive.